MBPN’s youth barn raising is a one-of-a-kind learning opportunity that provides information, exposure and experience through a traditional community barn raising common in Michigan communities during the late 19th and early 20th centuries. Similar to husking bees, quilting bees, and other shared work activities, neighbors depended upon each other to accomplish what they could not do alone. 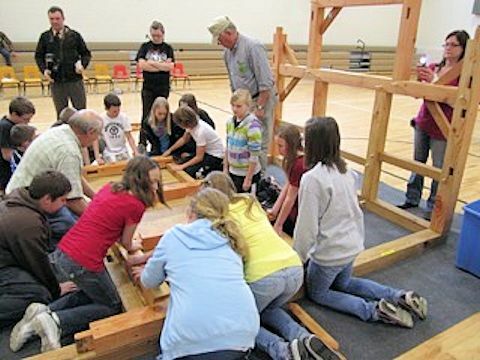 Students of all ages can erect a quarter-scale, timber-frame model barn. These 3-D hands-on, life-size puzzles routinely travel to classrooms to demonstrate historic construction techniques while challenging students to use their math, science, and engineering skills. Contact MBPN to ask about scheduling T&T for your group. Download the Teamwork & Timbers Venue brochure for more information.